Enables user to add an additional display. For use with EMS-HW model series only. Enables user to add an additional display. Simple plug-in operation makes it very simple to understand, and installation is very easy. This system includes one Remote Display, one Switch Box, and two additional cables. Some installation required. 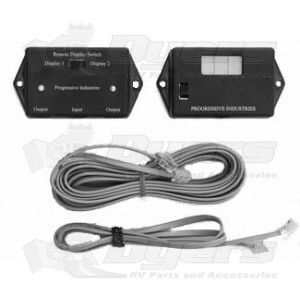 Digital display, scrolling continuously through the power source information: Voltage(s) current, frequency, error code, previous error code (if applicable). Placed one in the basement and the other inside by the slide switches. Now I can monitor current levels outside when I hook up during setup and inside while camping. Although I have yet to find time to install this second display, I certainly intend to. The unit that came with my EMS was installed near my power reel so I can see what is going on with park power when I initially hook-up. But I do want to be able to monitor power conditions without going outside the coach, especially if the weather is bad! The reason for the slight "knock" in quality was that I also wish the display units had a rear port for the data connections, better yet give the customer the option to select either a bottom or rear connection. Since the second unit will go inside my unit, a rear connection would make for a "cleaner" install in the control panel area I plan to have the second display. Dyer's was great however, fast delivery and the best price I could find online.